The C83 Persian by Ed Schempp was introduced in late 2003. It was discontinued in 2006, the same time a smaller version, the C105 Ed Schempp Persian 75mm was introduced. A G-10 version came back in 2010. The C83 Persian appeared in the 2004 and 2005 Spyderco product catalogs. Introductory notes by Ed Schempp. "Custom knifemakers are way more than just steel junkies. Many are great artists and deep thinking intellectuals with their own specialties and talents. They continue to bring spice, variety and new ideas to the knife world. Custom maker Ed Schempp is a wheat farmer who while driving his tractor through his fields has time to think. He thinks about knives and everything surrounding them: steel, designs, heat treat, metallurgy properties, and he also thinks wheat, but only because he has to. His signature symbol, wheat sheaves are found on all his knives. 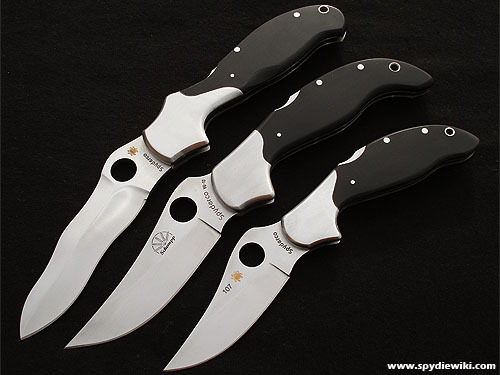 He recently collaborated with Spyderco in a design called the Persian Folder -- a well thought out mixture of classic Western meets the exotic East." "The shapely Persian blade is traditionally found in fixed blade form but Ed incorporates this Eastern influence into a folding knife. Made of VG-10, the hollow-ground blade is deep-bellied, ending in an upswept tip with a curvy spot on the spine where your thumb rests. The blade's curves flow through into the handle, which is black Micarta topped with polished steel bolsters. Not only do the curves add visual appeal, they create a finger choil and a crook in front of the index finger then end in a tail, for a myriad of grip positions. A custom designed steel pocket clip positions the knife so it carries right-handed, tip-up. 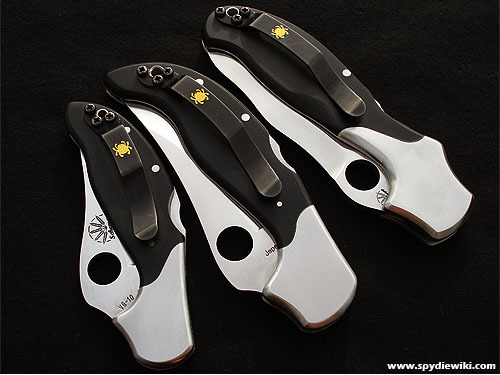 Balance combined with top-notch fit and finish mark this model an Ed Schempp design and a true Spyderco." "Custom knifemaker Ed Schempp has a talent for co-mingling indigenous and ethnic cutlery styles with American knifemaking methods. His Eastern influenced Persian folder has an undeniably ethnic upswept blade profile with a modern black G-10 handle." "Finger indents on the handle's underside situate the hand in a way that translates into comfort and cutting control. The Persian blade's full-curved belly ends in a graceful upswept tip offering both Middle-Eastern style and cutting performance. Made from high-performance VG-10 steel (flat-ground), a prominent hump above the Spyderco Round Hole creates a leveraging platform welcoming the thumb." "The curved steel pocket clip is designed for right-hand, tip-facing-upward pocket carry. The Persian features a David Boye Dent removed from the back lock's release, inhibiting inadvertent disengagement." "Balance, plus first-class fit and finish, makes this model truly worthy of bearing Ed Schempp's and Spyderco's name." The C83 Persian 2 by Ed Schempp in Spyderco's online catalog. See e.g. The Persian Army thread in the Spyderco forum. This page was last modified on 14 November 2016, at 02:25.